This book aims to provide college students with the algebraic skill and understanding needed for other coursework and for participating as an educated citizen in a complex society. Written by a recipient of a Mathematical Association of America award for expository writing, this book is designed to be read by students. It contains the student solutions manual with complete worked-out solutions to all odd-numbered exercises, written by the author to ensure consistency and the same high-quality standards as the rest of the text. As with the author's widely-adopted linear algebra and precalculus textbooks, this book features clear explanations of the main ideas. This book is available with the WileyPLUS online learning system, which provides online homework grading that gives students instant feedback while keeping records for instructors. Faculty who are potentially interested in using this book as a text can contact the author (algebra@axler.net) to request a review copy. This book is available in hardcover, softcover, binder ready, and electronic versions. 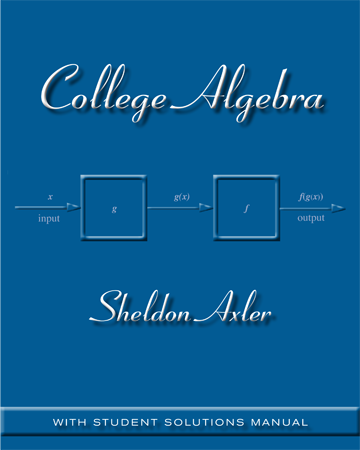 Follow @AxlerAlgebra on Twitter for updates on this book. Altogether, the text is a didactic masterpiece. a tour de force in the service of simplicity and clarity ... The most original linear algebra book to appear in years, it certainly belongs in every undergraduate library. Clarity through examples is emphasized ... I congratulate the author and the publisher for a well-produced textbook on linear algebra.